A few months ago, I stumbled upon an article on The Awl that asked "literary-inclined" people an interesting question: Which books make you cringe to remember? And they weren't asking for books that the readers had always found awful; they were looking for the books that had once seemed cool or smart or beautiful, until the reader one day became disillusioned. "I remember my freshman year of college, I briefly dated a junior (not to brag!) and told her that On The Road was my favorite book, and in my opinion the greatest achievement in American literature. 'You'll find that statement embarrassing in a couple years,' she said. I thought she was being so holier than thou, but… yeah." A few people questioned refused to answer. They wouldn't be who they are without those embarrassing books, they said. Books that were once so important to them cannot be called embarrassing. That's where I sit, I think. But then I'm still young. That's why I find this list so interesting. Are the books I love now going to seem embarrassing in the future? Do certain books have an age limit (a point where life experience or skepticism makes the ideas in the novel seem ridiculous)? 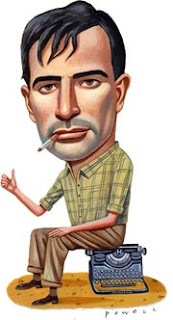 Jack Kerouac was the most ragged on author of the bunch, which I found funny. I know a number of people around my age (18-24, let's say) who love Kerouac. Another student in my English Senior Seminar class last year said On the Road was her favorite book and, more than that, was the book that first inspired her to write. But then I also remember a professor saying once that certain books need to be read at the right age to have the best effect. For example, a high schooler reading Catcher in the Rye will likely connect with Holden Caulfield more than a forty-year-old, and thus, enjoy it more. The book's merit seems to sway depending on your age. He said On the Road is a great example and it should be read in the late-teens/early-20s when a rambling road trip with your friends sounds more awesome than stressful. And that's why I'm picking up On the Road at the library tomorrow. Gotta read it while I'm still young! Do you have any former book crushes you now find cringe-worthy? What do you think of Jack Kerouac or (the #2 choice) Ayn Rand? I haven't read either of them (yet!). I definitely think it's possible to love something at a certain age and be embarrassed by it later on in life. I can't think of a particular book that that's true of for me, but I can think of a movie--when I was 16, I thought Garden State was a profound and brilliant work of art. And now, at 24, it makes me shudder. I can't watch it without cringing at my angst-y teenage self. That said, I think it's kind of cool to look back at different times in your life and remember how you were feeling at the time by what books/movies/music you liked, however cringe worthy those things may be now. Definitely. I have a hard time thinking of a book example, but for music I can think of a bunch. I had a phase where I loved Tegan and Sara and another where I played The Strokes over and over again. I still like one or two songs by both those bands, but any more than that and I'm cringing. They irritate me now. But I can appreciate that at one time they had me enthralled. I haven't read On The Road, but being in college I know a lot of people my age who swear by it. Like you, I guess I'd better read it while I'm still young-- some books definitely appeal more to people in certain stages of life. Now, I had to read two Ayn Rand books for high school and I think there's definitely good justification for her being #2 on the list. Her books are so "in-your-face" and, really, a philosophy which regards personal material satisfaction and achievement as the only things which matter in the world probably has the most appeal to young people-- for most people, she's definitely cringe-worthy. I was surprised by Stephen King being nominated. He may churn out popular books, but he definitely can write. Anyway, really interesting post. What you said about Ayn Rand is exactly what I've heard. I'm not sure I'll ever read her books. They sound too "in your face" for me. And yes, I was surprised by Stephen King too! He has so many books and great ideas for horror stories. The arguments against him were pretty weak though. One person just said they didn't like his "war on adverbs." That is exactly the age I was when I read On the Road and I loved it! I wouldn't necessarily say that I am embarrassed for loving it so much back then, but I will say it is no longer my favorite book. ;) I am glad I read it ~ I even have a CD box set of him reading selections of his work, accompanied by the pianist Steve Allen. I will have to read the whole article you referenced; I would definitely have to say I agree, some authors resonate to different age groups better than others.